This vegan chicken noodle soup is full of all the good stuff. 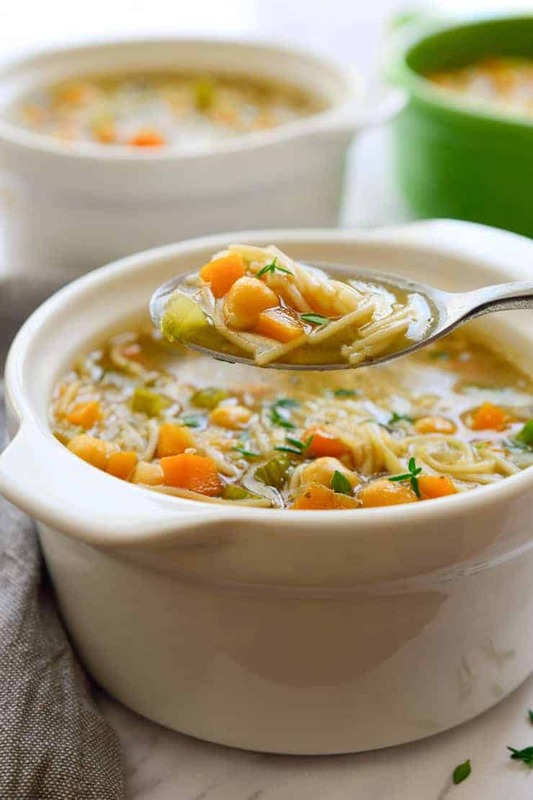 This hearty little soup is packed with veggies, noodles and chickpeas and is totally oil free. The key to a great soup starts with the stock and this recipe takes advantage of vegetable scraps which would normally be thrown away! Maybe you’ve also seen that video going around on Facebook for the last year and a half showing how to make vegetable stock from kitchen scraps. What a great idea! 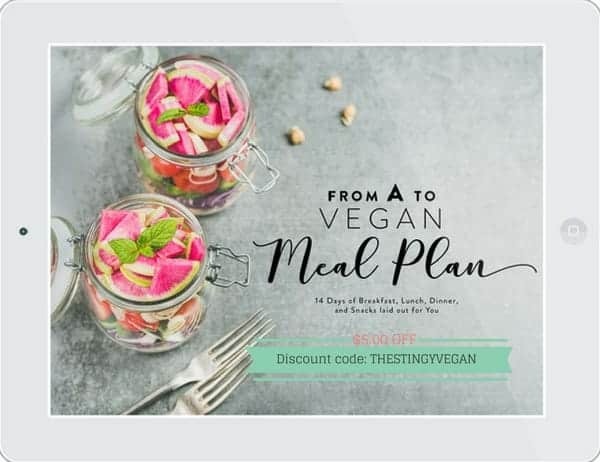 Not only are you getting a tasty stock for free but you’re also taking advantage of something that would normally be composted or thrown away! The idea is simple: every time you peel and prep veggies, put the peelings, leaves and end bits in a freezer-safe container (of course you’ll want to thoroughly scrub and wash your veggies beforehand to get the pesticides and contaminants off). Just keep on adding to the container in the freezer until it’s full. Transfer your veggies scraps to a pot, cover with water and simmer for 45 minutes. As you’ll see in my video below, I added an additional fresh onion. Feel free to add any other veggies, herbs and spices for extra flavour (check out my recipe for vegan pho for a delicious spice mix for everyone’s favourite soup). From my three litre bag of vegetable scraps I ended up with seven cups of stock. Enough to make a big pot of vegan chicken noodle soup! Making vegan chicken noodle soup is super easy. Just chop up some veggies and sweat them off in a pot with a splash of the stock to soften them a bit. Add the veggie stock, your noodles and chickpeas in place of chicken. Once the noodles are cooked you’re ready to serve! I like to use fideo cut noodles which are vermicelli-type noodles that are popular in Spain and Mexico to make sopa de fideo. 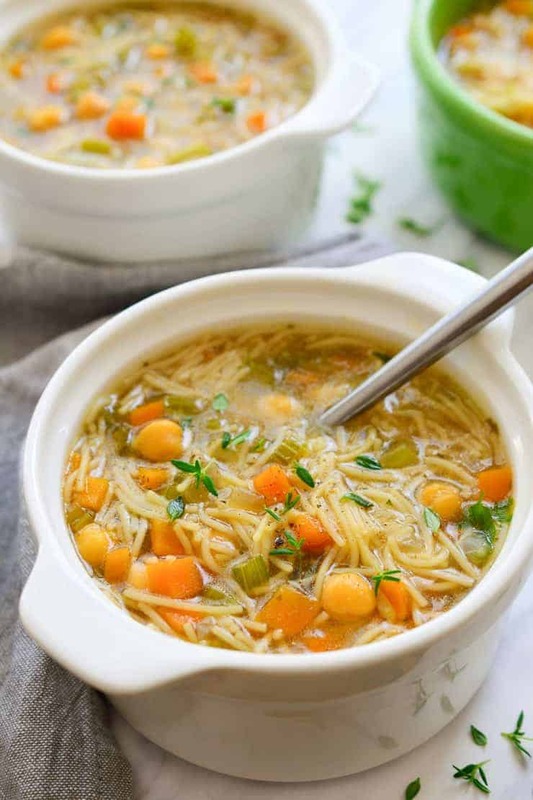 It doesn’t matter if you can’t find this type of noodle; you can use any type of pasta or noodle for this vegan chicken noodle soup recipe including gluten-free noodles if you prefer. This oil-free vegan soup is super easy, super cheap to make and just what you need to fill you up on a chilly afternoon! 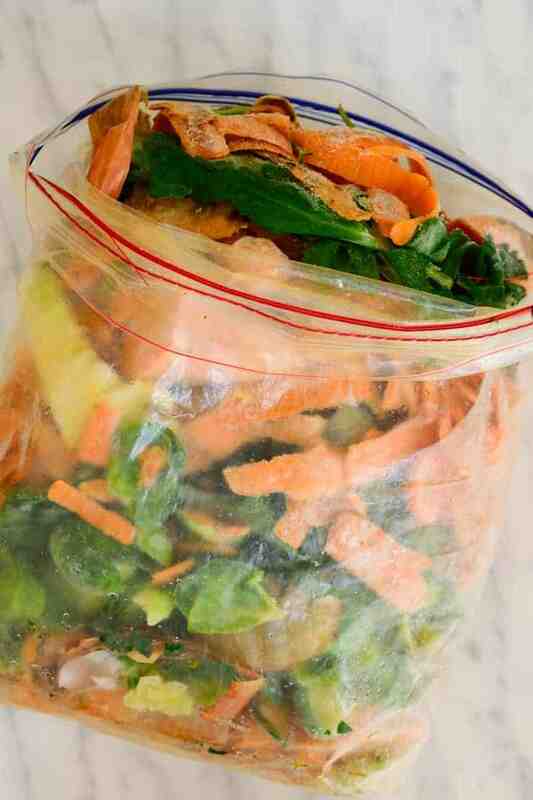 Each time you prep veggies, store the peels, leaves and end bits in a freezer-safe container. Be sure to scrub your veggies well beforehand. Once you’ve collected about 3 litres, transfer them to a pot and cover with water. I added and additional quartered onion for extra flavour. Bring to a boil then reduce the heat to a simmer and simmer for 45 minutes. Strain the stock and set aside. I ended up with about 7 cups. (Obviously you can skip this if you’re using prepared vegetable stock). In a large pot over medium-high heat, cook the diced onion and garlic in a splash of the veggie stock until tender. Add more stock if the pot becomes dry. Add the carrot, celery, dried herb of your choice and bay and sweat them off until they begin to soften. Add 6 cups of your vegetable stock and bring to a boil. Reduce to a simmer and cook until the veggies are soft then add the noodles and chickpeas. Simmer for the length of time indicated on the noodle package. If you’ve got extra stock you can use it to thin out the soup if you want. Add salt and pepper to taste (a tablespoon or two of soy sauce is delicious). Serve immediately and garnish with a sprinkling of fresh herbs if desired.